The government recently announced that they are looking at changing current divorce laws in a planned overhaul to modernise divorce procedures to meet with current lifestyle changes and to remove the element of blame from divorce proceedings where one spouse has to prove the fault for the marriage break down was caused by the other. Although the proposed changes are still in the consultation stage, it is hoped that by removing the element of blame from divorce proceedings that the whole divorce process becomes a less hostile environment for both parties. Divorce campaigners have welcomed these proposed changes, saying that the major problem with the divorce process is that it is far too antagonistic. Currently, many divorcing couples have to demonstrate to the court that their marriage has been irretrievably damaged by citing the adultery or unreasonable behaviour of the other partner. In cases where one spouse cannot prove that the blame lies with the other, they may face having to wait for two years or more should both partners consent to a divorce, or even face a wait of up to five years or more if one spouse refuses their consent to a divorce. This can be a very stressful and emotional time for both parties, especially where they have children. Should the new plans for a ‘no blame’ divorce become law, couples will no longer need to prove that one of them is at fault. This should lead to a more amicable split. 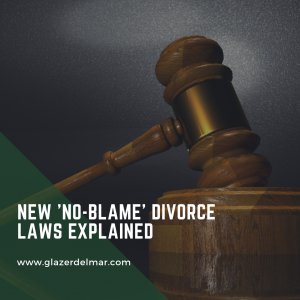 If you are thinking about starting divorce proceedings, please call 020 8299 0021 or email familyandrelationships@glazerdelmar.com to book an appointment. We do not know at present if the suggested reforms will come into law, but we always try to offer a constructive approach to helping you at this difficult time when dealing with the law as it currently stands.